Today we would like to take a look at one of Sharp’s Smart TVs, namely the Sharp LC-55CUG8462KS. This is a 55-inch budget 4K Ultra HD Smart TV that does not support 3D. Before we get into details for the model itself, let’s say a few words for Sharp TVs in general. Most of Sharp’s 4K UHD TVs are what we’d call budget models which offer some decent to very good picture. The more expensive Sharp 4K models also pack some very nice features even if they don’t quite compare effectively with top shelf models from Samsung, Sony or LG. In other words, Sharp is a very decent go-to brand if you want to get started with 4K that offers quality but don’t want to spend a fortune. The extras in Sharp 4K UHD TVs are not superb but can be described as decent. The Smart TV platform is inferior to LG or Samsung and HDR, 3D or quantum dot colour are not offered at all. However, the Sharp’s main 4K TVs and especially the top shelf options are fairly solid performers and have what to offer to viewers on a budget that are not looking for really fancy 4K TV features. When price and other features are all considered, Sharp’s TVs are actually winners in terms of their display quality. We’d actually go as far as to consider them superior to Vizio’s larger M-Series 4K TV models in many ways. Contrast in the Sharp 4K TV models is good to great across the board and color palettes looks quite decent. Furthermore, the Revelation Upscaler does a fine job for all types of noticeably sharpening most sources of non-4K content, particularly Full HD video. In terms of color, the Sharp TVs perform decently to well with more or less decent level of color gamut. The 55-inch option – LC-55CUG8462KS is a good-looking flat-screen option with modern and sleek design. The screen is trimmed in silver metallic outline and the TV is situated on two legs at the separate parts of the screen which makes it a bit difficult to place on a small table. Fortunately, the TV can be wall-mounted. In regard to features, the TV offers Smart TV, web browsing, supports multiple audio, video and image formats and has built-in web applications. In terms of communication you get built-in Wi-Fi, 3 x HDMI, 3 x USB, LAN, headphone jack – pretty much the basics. You can use Facebook, Twitter and Youtube but, as expected, cannot stream content from services such as Netflix and cannot use a Chromecast device. The processor is single core and not the most powerful solution but can get its job done fairly well. The 2 internal speakers use Dolby sound system, nevertheless you may look into adding sound. 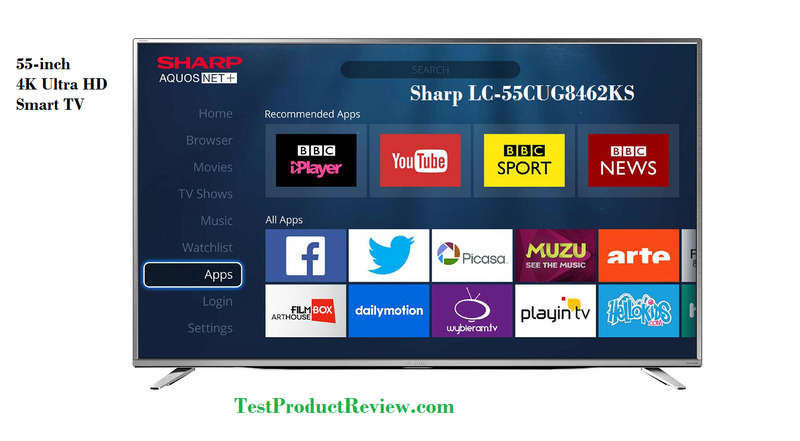 I hope you liked my presentation of the 4K LED TV Sharp LC-55CUG8462KS. Feel free to leave you comments about this review, I will be more than happy to hear from you. In case you are interested in other Sharp TVs I would recommend you to check the smaller 24-inch LED panel Sharp LC-24CHF4012E.